EDI Generator - Creates an outbound UN/EDIFACT EDI Message. EDI Translator - Parses and translates an inbound UN/EDIFACT ORDERS D01B EDI file. EDI Acknowledgment - Generates a CONTRL file after validating an UN/EDIFACT EDI file. Excel_Validator - Excel program that validates UN/EDIFACT EDI files. ExcelINFENT_Inbound - Translates a UN/EDIFACT INFENT EDI file into an Exel spreadsheet. 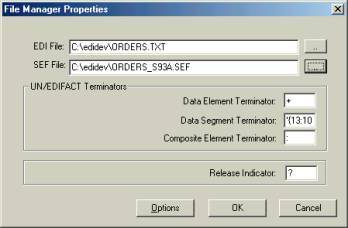 ExcelEdiEdifact - Generates and translates a UN/EDIFACT ORDERS (Purchase order message) EDI file from/to an Excel workbook. ExcelTranGen_DESADV - Generates and translates a UN/EDIFACT DESADV D99B (Despatch advice message) EDI file in Excel workbook. ExcelEdi_IFTSTA - Generates and translates a UN/EDIFACT IFTSTA (International multimodal status report message) EDI file from/to an Excel workbook. ExcelEdi_IFTSAI - Generates and translates a UN/EDIFACT IFTSAI (Forwarding and transport schedule and availability information message) EDI file from/to an Excel workbook. vbNet_Ack_CONTRL - Program that acknowledges a UN/EDIFACT INVOIC file with a CONTRL EDI file. cSharp_CODECO - Translates/Generates a UN/EDIFACT CODECO D95B (Container Gate-In/Gate-Out Report Message) file. cSharp_CUSCAR - Translates/Generates a UN/EDIFACT CUSCAR D95B (Customs Cargo Report Message) EDI file. cSharp_CUSDEC - Translates/Generates a UN/EDIFACT CUSDEC D96B (Customs Declaration Message) EDI file. cSharp_CUSRES - Translates/Generates a UN/EDIFACT CUSRES D96B (Customs Response Message) EDI file. Please note that the example programs have an evaluation SEF file included. What is SEF?